7th February 2016: Vigor Events and Cube Training and consultancy Center recently hosted Dr. John Gray; The world’s top relationship expert and author of 17 books which have sold over 50 million copies in 50 different languages around the world. Considered one of the most trusted voices in relationships today, Dr. John Gray conducted 2 very unique and interesting sessions to better understand the differences between men and women. His morning session titled “How to Get What You Want at Work” based on the book by the same title analyzed the ways men and women misunderstood and misinterpreted each other in the workplace, and he offered concrete advice on reducing unnecessary conflict and frustration. Applying his trademark practical advice to everyday office issues, he coached attendees on how to achieve their goals and make their workplace a source of fulfillment. The enlightening seminar provided a greater awareness and appreciation of the diverse characteristics within each gender—and how these differences could positively or negatively affect productivity. 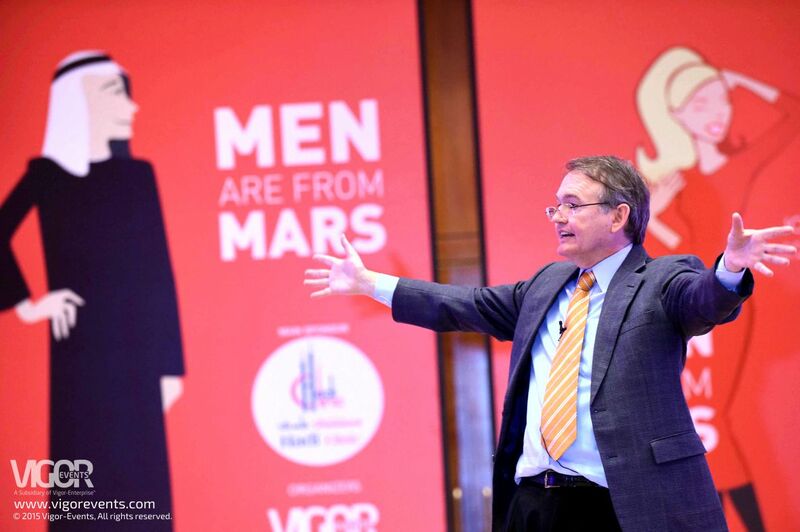 On the same evening, Dr. Gray presented an evening session based his New York Times #1 best-selling book of the last decade – “MEN ARE FROM MARS, WOMEN ARE FRON VENUS”. With more than 500 people in attendance, This LIVE Session gave attendees different scenarios from both the woman’s and the man’s point of view and offered up advice on how to counteract differences in communication styles, emotional needs, and behavior patterns. John Gray’s fun and dynamic real life stories and humorous anecdotes had the audience abundantly entertained through the evening. For more than 35 years, John Gray has conducted public and private seminars for thousands of participants. He is a popular speaker on the national and international lecture circuit and often appears on television and radio programs to discuss his work. He has made guest appearances on Oprah, The Dr. Oz Show, Good Morning America, The Today Show, The CBS Morning Show, Live with Regis, Fox & Friends Weekend, Larry King Live and many others. John has inspired numerous Fortune 500 companies, national trade associations, non-profits, and educational institutions with his entertaining and engaging talks that deliver “aha!” moments to every audience. His presentations are fun, dynamic, and full of real-life examples, including the very latest brain research on the gender differences in the workplace and at home.